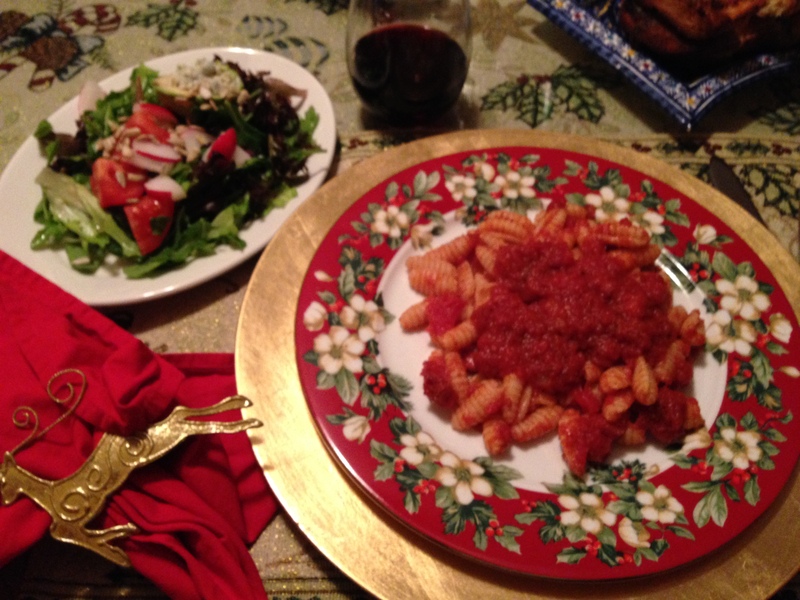 Simple Christmas day dinner with homemade cavatelli (compliments of Assenti Pasta in Little Italy, San Diego) and my version of a homemade arrabiatta sauce, complete with salad and garlic bread. Cook pasta, drain, and serve with spicy arrabiatta sauce – buon appetito! Light, healthy, simple, and delicious! 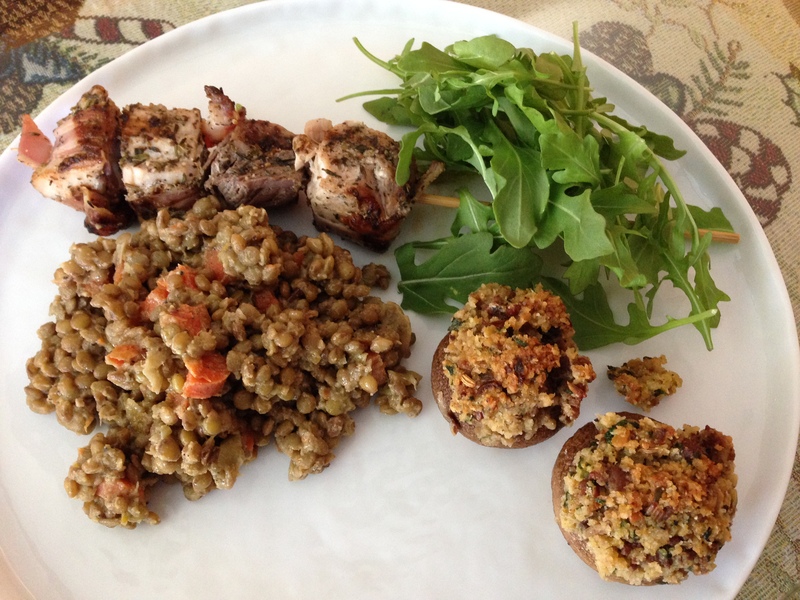 (Recipes compliments of Ina Garten and Giada De Laurentiis) Started off with Sausage Stuffed Mushrooms (Ina-recipe in a previous post on August 17, 2013) followed by Swordfish and Pancetta kabobs (Swordfish Spiedini – Giada), Warm French Lentils (Ina Garten) and a few arugula leaves tossed in a light lemon vinaigrette. I purchased fresh swordfish from Blue Water on India Street in San Diego. (Awesome place if you haven’t been.) Cut swordfish into 1×1 in. cubes and toss in a bowl with a few TBSP olive oil and a couple TBSP herbs de provence. Insert about 4 pieces onto each skewer (previously soaked in water for 30 minutes) with very thin cut pancetta threaded throughout. When ready to cook, place on very hot grill (stove top or outdoor) and turn onto each side for about 2 minutes per side. The fish is done perfectly and the pancetta is nicely crisped! Rest for a minute or two, then ready to serve. The lentils are a staple in our house, and I thought they’d pair well with the swordfish for a light (and healthy) dinner. Saute a couple carrots (1/2-inch chopped) and one chopped leek (white and light green parts) in olive oil for about 5 minutes. Add one chopped garlic clove and saute for an additional minute. Set aside. Bring 4 cups water to a boil with 1 cup dry lentils, 1 turnip (cut in half) and one whole (peeled) onion stuck with 6 cloves. Once boiling, add the carrots and leeks, reduce heat, and simmer about 20 minutes until lentils are tender. Discard turnip and onion, strain lentil mixture, and toss in a bowl with 1 tsp. unsalted butter. In a separate bowl, make a Dijon vinaigrette. (1/4 cup olive oil, 2 TBPS red wine vinegar, 4 tsp. Dijon mustard, 1 TBSP kosher salt, and 1 tsp. black pepper. Add warm lentils to vinaigrette, toss, and let stand for about 15 minutes. Ready to enjoy! Christmas Eve dinner was light and satisfying, with the extra indulgence of Sausage Stuffed Mushrooms and homemade Christmas cookies for dessert!